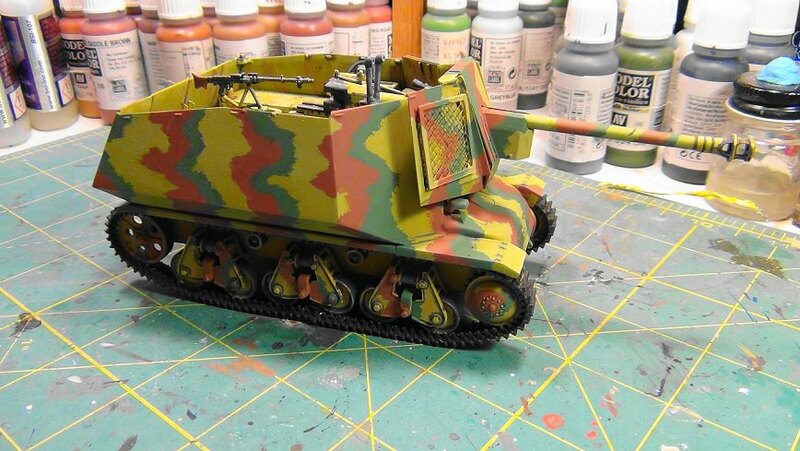 Great camo, how did you do it, freehand or airbrush? That is some nice work you did there with that turret. 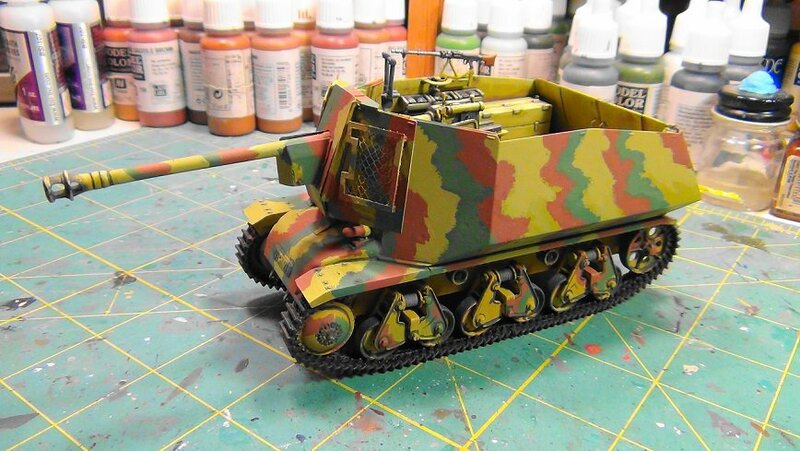 Update on my Marder I. 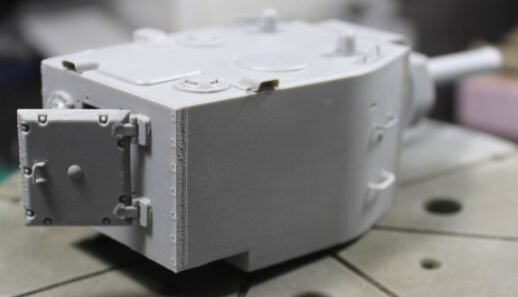 Camouflage pattern has been applied to the exterior of the tank. Decal work is up next. What's left to do? Weathering, adding the crew figures, and adding some stowage. Matthew, The gear box looks nicely detailed...well done. Mark, Thanks. I always like adding figures to my vehicle builds. Shawn, Your NBCR Striker is quite impressive. Incredible surface detail. David, The THAAD is awesome looking. Wow, what a bonehead move messing up the spelling on the decals by Trumpeter. Hahaha. Chuck, The Gigant is shaping up nicely. Is there a large patriotic slogan for that massive turret? I am not very familiar with US military equipment, but it definitely looks impressive. I like. Great work. I've always been thinking about what the Soviet designers have been doing to make such mastodons. I look forward to the working progress. Success! 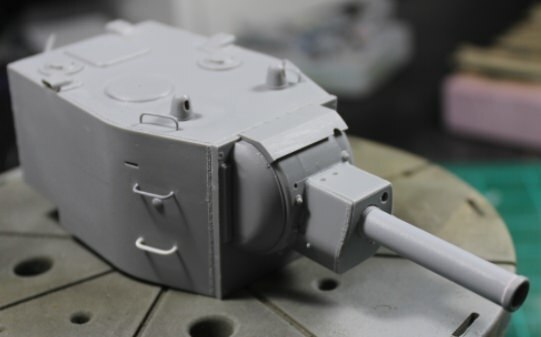 Here is more progress on the KV-II turret. I'll hold off on adding the rear machine gun until I'm ready to start painting. Had to replace one grab handle after losing it somewhere in the man cave. I left the rear turret door workable as I may want to display it open just a crack when it sits in a diorama. I drilled out the left side pistol port/plug and will attach the plug to a small chain when I've completed this project. Funny, Trumpeter only provides one pistol port plug in this kit. It's really great to see everyone's builds coming along so well. It sure provides a lot of inspiration for the next project. Very nice assembly and camo work on your Thaad. To bad about the decals, did you use them anyway? I did not use the mis-spelled ones. I made a post about the decals with pics of them on the Trumpeter/HobbyBoss build group Facebook page. I did get a response from Trumpeter that stated "The person responsible for the decals lost a half months pay" I'm guessing that they will correct them. Trumpeter is rather responsive on their build group - I even got an email address to order spare parts for Trumpeter kits, which worked fantastic. In about 2 days I was able to order a replacement decal set for my 1/350 Kitty Hawk. $4 for the 2 large sheets plus $4 to ship it from China. Shawn - Congratulations, on your build. It looks detail heavy and makes me wish I had time to slot one in. David - Looks great! I guess something was lost in translation, on those decals. Very nice clean work considering all of the detail there is on this vehicle. Looking at the first picture and before the other two I thought it was a space ship of some type with all of the hardware on top, LOL. I hope it not to much of a challenge to paint and weather. I haven't posted in here a while, and its impressive to see everyone's progress. Ive made considerable progress on the NBCRV over the last week. This kit has over 750 pieces, and it has been quite an adventure assembling it all. I also started collecting and cleaning up the resin stowage. Really great work with those figures. I only knew where the fenders angle was wrong. I'd be grateful if you tell me where the problem is. Before I start the camouflage paint scheme, I added foliage attachment screens to the gun shields. Photo references show these vehicles having these items. I made them out of styrene sheet and plastic wedding veil. 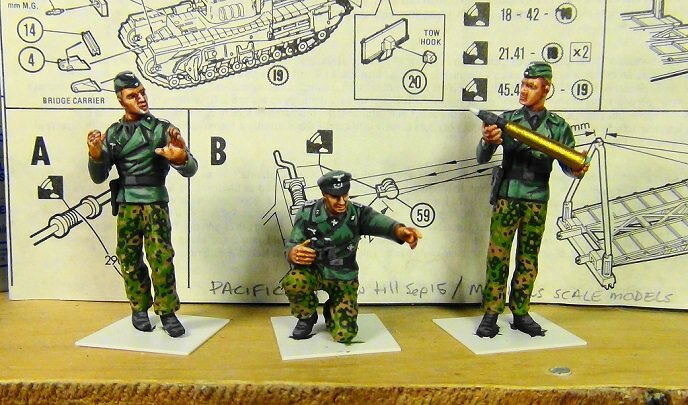 Painting on the crew figures is complete. 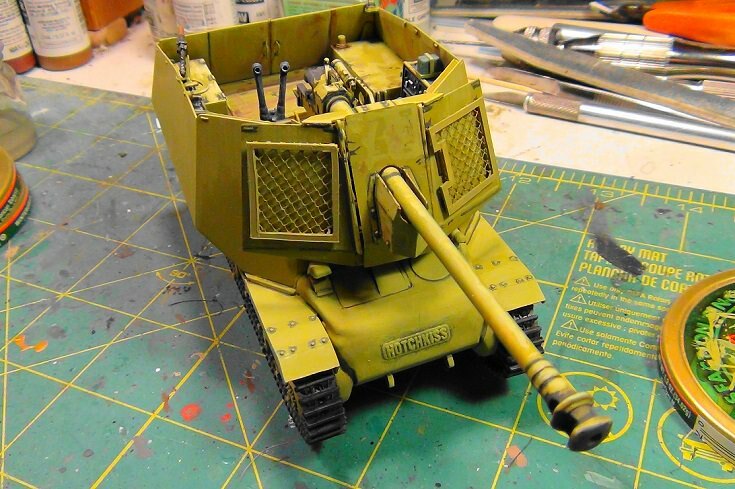 Nigel, initial paint coat on your self propelled howitzer looks good. I like the shade of green. Kalin, love the weathering on your halftrack. Road dirt looks realistic. Jbranca, the T-64 build turned out wonderfully. Wow, that tank has all kinds of surface detailing. Good luck with the painting phase. David, the THAAD chassis has an incredible amount of detail. Well done. It will be easier to explain you in our native language-next time we meet! Matthew, congratulations on your choice. I look forward to the next development. Jerry, a very good job of assembling. I'm interested in the painting and color modulation of Russian technique. I also see a KВ-2 in the campaign, which is developing very well. 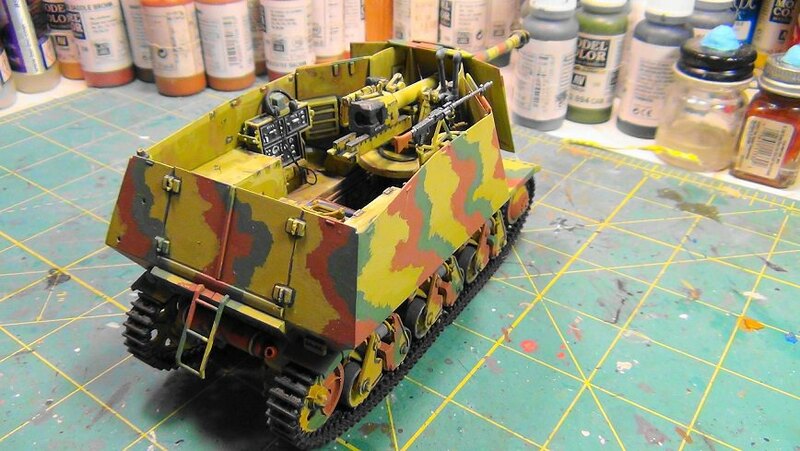 Matthew, yes, good work so far on the Sd.Kfz.7 - after I read your and Angel's comments, I looked up Terry Ashley's review of this kit on PMMS and he called it a Jekyll and Hyde kit with lots of accuracy issues - looking forward to your improvements. And David, good progress on the THAAD. When I start building this kit, I'll try to correct them with Milliput epoxy putty. Nice job on the gearbox,Matthew! Thanks Angel. I have attempted this kit, twice during my younger years. Both were disastrous. I figure that I am competent enough to give it one last go. There are a ton of errors, which I will attempt to correct. The only snag is the fenders being the wrong angle. This is beyond my skill to correct.